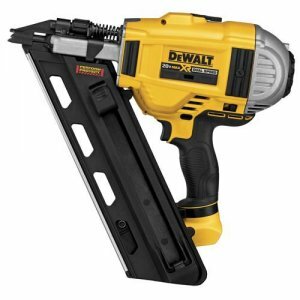 DeWalt has always received high reviews for their cordless gas-free trim nailers, and now it seems they are ready to utilize their technology in a more powerful cordless framing nailer. The DeWalt DCN692 will be their first dual-speed gas-free 20V Max Cordless Framing Nailer. Cordless framing nailers are nothing new, but they are usually powered by a combination if gas and battery power. The DeWalt DCN692 relies solely on battery power and therefore reduces costs by eliminating consumable gas canisters. With a dual-speed setting, the new DeWalt cordless framing nailer can drive nails of varying lengths and save power by using the lower speed setting to drive shorter nails (2" – 3"). It also allows shorter nails to be driven at a faster interval. The higher speed setting is designed for longer 3-1/4" – 3-1/2" nails. The nailer accepts paper-tape collated 30°-34° clipped or full round offset nails from a variety of brands. A selector switch lets the user to choose between bump or sequential fire modes. With a new product like this we always wonder if it will be powerful enough to meet user demands, but DeWalt claims that the brushless motor combined with their Extreme Runtime 4.0Ah batteries allows the nailer to shoot up to 700 nails on a single change. Let's hope the DCN692 sees the same positive reviews that its predecessors saw. The new nailer will be available this February as a kit (DCN692M1) that includes a 4.0Ah battery pack, and as a bare tool (DCN692B). They will retail for $499.99 and $399.99 respectively.